You have ten minutes to make phone calls, and you’re looking for immediate revenue. Who should you call? The pyramid is your guide. Start at the top and work your way down. First, call customers who could buy more from you right now. Get a meeting to talk about immediate needs. Let them know other ways you could serve them. Find out what is coming up so you don't miss an opportunity. What if you’re already the preferred vendor at an account and getting the majority of the work? If you’re wondering if calling them is the right way to spend time, consider three factors. · Are there threats to your position in the account? · When was the last time you had a face-to-face meeting? If more than a month has passed, make a call and schedule a meeting. · Is there something new you want to sell them? If the answer is yes, go talk about it. Second, call prospects you have met with 3 or more times. 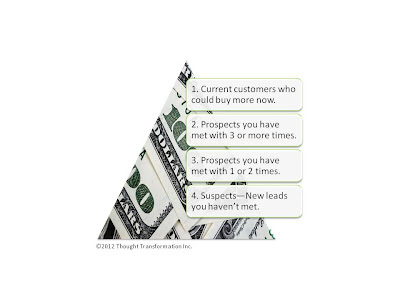 Meet with them to find a way to get an opportunity and convert them into customers. Third, call prospects you have met with once or twice. Continue the process of developing a relationship and identifying a need. Focus on building trust, demonstrating competence and identifying a problem you can solve to move them forward in the sales cycle. Fourth, call suspects. These are leads who you haven’t met. Call to get an initial introductory meeting. In ten minutes, you can call three people. If you’re looking for immediate opportunities, be smart and selective about who you dial and you will sell more.